Sedona, AZ is the kind of town you want to get out and explore. Lots of neat scenery, amazing views, and a really unique landscape. That's why there are so many tour companies in the city. 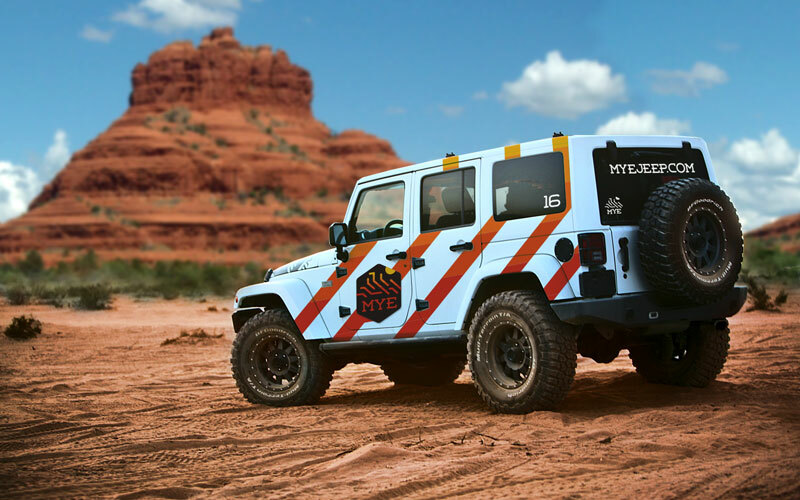 I was contacted by Hawk, owner of Make Your Expedition — a jeep rental company located in Sedona. While Pink Jeep Tours have become somewhat ubiquitous in the region, Hawk's business focuses on self-guided tours and rentals. allowing people to do exactly what the name suggests — make their own expeditions. One of my personal favorite formations (and one of the most famous, coincidentally) in Sedona is Bell Rock. I decided to use this as a primary focus of the mark, pulling key lines from the rock to create an icon that also showcases a concept of many different routes/lines creating one concept, a deep connection to the genesis of the company. I also pulled in some inspiration from the National Forest/Park Service signage found throughout the region — the brown background, funky shape, and rounded edges are inspirations I really wanted to reflect in this brand. As the company grows, I envisioned the brand expanding into branded vehicles, something that will help the brand stand out in a very touristy area, and no doubt help generate more sales and sustainable long-term growth.